Some idiots, in the form of Ministers, Deputy Ministers, Members of Parliament, State Assemblymen, Political Secretaries, moronic leaders of the BN component parties and UMNO ‘heroes’ like Mike Tyson and KJ will continue to be BLIND. BLIND TO THE FACT THAT MALAYSIANS HATE ABDULLAH AHMAD BADAWI & HIS GOONS FOR RUINING THIS BELOVED COUNTRY IN LESS THAN JUST 5 YEARS! This useless Prime Minister and Umno President has PARALYSED UMNO & the entire BARISAN NASIONAL framework with his much acclaimed ELEGANT SILENCE & 1st CLASS CORRUPTION. When Tun Dr.Mahathir Mohamad handed over the leadership of this proud nation on 31st October, 2003, MALAYSIA was a much respected nation in this whole wide world. WE, as a relatively young nation which was less than 50 years old then, commanded great respect and admiration from every continent. The world stood still and listened to what we had to say and took note of our concerns then because we, AS A NATION, were successful, united, progressive and could achieve anything that we set our eyes upon. WE WERE LEADING THE THIRD WORLD THEN … with remarkable contribution and directions in numerous fields that mattered, which includes the highest seat in the Non-Aligned Movement (NAM) and the Organisation of Islamic Conference (OIC). BUT now, just less than 5 years down the road, I REALLY WONDER WHERE WE STAND. Leave the external matters to REAL leaders like Chavez and the like, just look at us – MALAYSIANS and this blessed nation of ours. Do we still exist within ASEAN or have we moved to some backwaters in TIMBAKTU? WHY IS IT THAT WE MUST, I REPEAT, MUST LIVE WITH A LEADER LIKE ABDULLAH AHMAD BADAWI … WHY? I’m damn sure that this whole bloody country could see WHAT KIND OF A LEADER he is! Malaysians must be really stupid and deserve to burn in HELL if they still believe in Abdullah Ahmad Badawi. Pak Lah! THE Time for you to go is NOW, not in March, 2009. STOP listening to your BLIND soothsayers as their crystal ball has crashed again, in Kuala Terengganu. p/s I’m not suggesting that THE LIAR should be the next Prime Minister either because under the leadership of a compulsive LIAR & BUGGER we will burn in HELL sooner … like the inhabitants in the city of SODOM. Read the STATESMAN's VOTE OF NO CONFIDENCE AGAINST BADAWI in Malaysiakini HERE. & HERE. If Abdullah is really that bad, then why in hell did Mahathir choose him to take over in the first place? Was is because Abdullah was so superb at pretending to be a great and competent leader that the ultra sharp Mahathir failed to see through him? But then if Abdullah could pretend so well that he succeeded in pulling wool over Mahathir's eyes, he must be really smart. 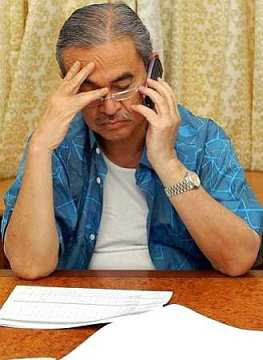 Or did Mahathir know that Abdullah is really this bad but went ahead and make him PM anyhow. But if Mahathir did that, it shows that he had some really bad intention. But that can't be as well, because not long after Abdullah became PM, Mahathir started to whack him left, right and centre. In conclusion, it's either Abdullah is a genius who fooled Mahathir (who then realised he had been fooled and got angry) or Mahathir had bad intentions (and got angry when he failed to assert his will on Abdullah). Halo, tok guru Hadi pung suruh Paklah stay onlah.